This report is original material reflecting my work with clients, research and experiences over the last few years with this little-understood archetype. 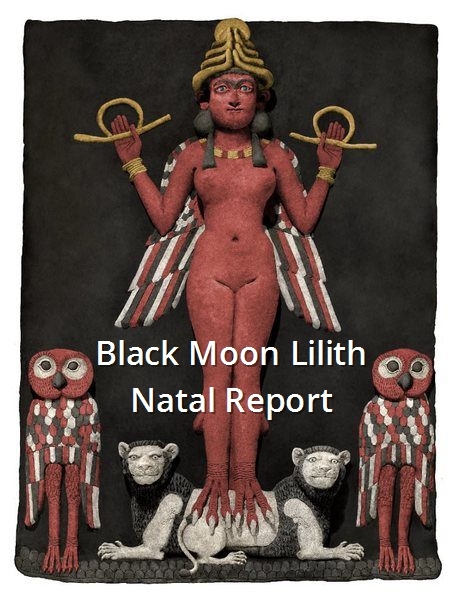 The report has a 4500-word essay on Lilith’s myth and astrology, and discusses the point in your chart. 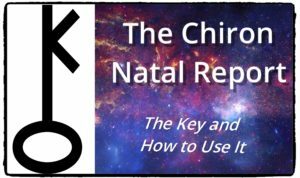 I use the mythology to show how the archetype informs people’s lives, and your BML placement is delineated: natal house & sign, natal aspects to other planets/points, and important upcoming transits and progressions to your natal BML. You can expect it to be between 10,000-13,000 words (20-25 pages), depending on your natal aspects and the transits and progressions that may be affecting you. See a sample report for Sean Penn here. The exchange rate is $35. These reports are processed by Astrolabe, and questions about your order should be addressed to orders@alabe.com. Don’t CC me on note to them, as I’m entirely out of the loop about orders and fulfillment. Which report would you like to order now? Where shall I send the report? Tell me about the person receiving the report. The Lilith archetype, banished to the cultural Gulag archipelago a few millennia ago, is now returning to power and the light of collective awareness. I appreciate Tom Jacobs’ work in this territory for a number of reasons. He writes and thinks with clarity, passion and elegance. He punches hard, but he is never fatalistic – you won’t be banished to the Gulag by his words either! And finally I appreciate that he is a man, which helps all us men reclaim our own inner Liliths — Liliths whose exiles are even colder, more silent and more extreme than those of the world’s women. – Steven Forrest, author of THE INNER SKY and YESTERDAY’S SKY. 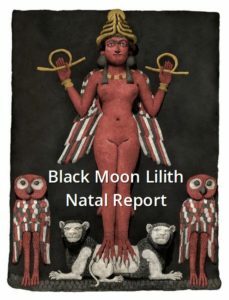 Tom Jacobs’ wonderful interpretation of the True Black Moon Lilith is truly enlightening and brilliantly written. Lilith has had some bad press, all the way from the bizarre to the horrid, but Tom gets straight to the heart of the matter and helps us to see what often lies hidden. This report makes compelling reading; I found myself nodding in agreement or reading something through twice as realizations hit their mark. This is a great contribution to our understanding of this mysterious entity. As Tom says in the report ‘…you’re opening yourself to reconnecting with a deeper layer of your being.’ Bravo, Tom, great work! I am truly blown away by the level of insight and depth of vision in your work. WOW. Reading your report has been cathartic. These aren’t easy truths to face up to, but doing it is a vital part of where I am now. This report surprised me with its level of detail and relevance. It truly did add something to my chart that I wouldn’t have realized without it. Great work, Tom! Thank you!!! I LOVE my report! The Pluto transit to Lilith is so right on right now – it’s not even funny. [The section on] Lilith in Scorpio in particular put quite a lot of my past into perspective, a past in which I have at various points felt like a mad woman in the attic and a needy, clinging creature, with whom I actually don’t identify at all – there just didn’t seem like there was any other way to define my actions. 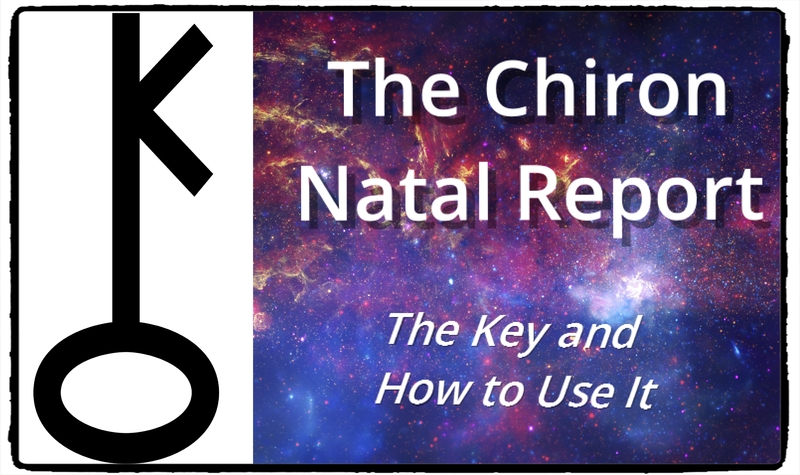 This original natal report explains my approach to the centaur Chiron, beyond the apparent dichotomy prevalent in astrology of being wounded or a wounded healer. It takes you into a spiritual teaching about opening the heart, healing, and the importance of compassion for personal and collective evolution during this time of shifts and changes on Earth. Read a sample report for Donald J. Trump (21 of 30 pages). In early 2008, I asked Ascended Master Djehuty (a.k.a. Thoth, St. Germain, Merlin, and Hermes) about what to expect with the end of the Mayan Calendar (2012). His answer was a set of teachings on Chiron that involves transforming our relationship with our innate energetic sensitivity and emotion so we’re more fully expressing out humanity. I translated his message about the critical learning waiting for humanity now about our true nature as energetic beings, which is to say emotional beings, into an astrology teaching on Chiron. My book Chiron, 2012, and the Aquarian Age: The Key and How to Use It explains that teaching in its entirety, and this new natal report builds upon it. The report is based on the same teaching as what’s in the book, but is not copied and pasted from the book. Beginning with an opening essay on how I understand Chiron including myth and archetype, the report then explains your natal house and sign placements. Next come aspects with other natal bodies and points in your chart, transits and progressions to Chiron happening now and beginning during the next year, and also current and upcoming transits of Chiron to bodies and points in your natal chart. The length of your report will depend upon the number of aspects, transits, and progressions involving Chiron in your chart. Most will be at least 25 pages, most more like 30-33. This report is currently being assembled by hand, so allow up to 2 weeks for delivery. Investment: $35. Order via PayPal and then email me with your full birth data or contact me for another form of payment. Your report is truly wonderful — deep and insightful. It will inspire me for a long time. Wow, thank you so much, that is really good work, the natal positions are enlightening. And the progressions and transits, describe exactly what I am going through right now and also starting to be aware of as a process, that is going to be a part of my life, the next few years. And your words are really helpful. And like a beautiful, shining, friendly light on my personal sensitivities and in all honesty, my deepest feelings and desires. I now have this to work with and it is great to debunk some myths or assumptions about Chiron, to see that healing and evolution is possible. Wonderful, illuminating. YOU are simply amazingly fabulous! I’m so grateful for this Chiron Report. You are my new favorite astrologer. I just am in complete awe about how exactly every word completely resonates with my path. I am so committed to embracing this [Chiron] return & fully intend to feel into my lessons that I just know the Universe will unfold upon me with grace & ease as I continue to do my part. The end of the Mayan Calendar was on a lot of people’s minds for a few years, and just what was to or did happen and what it meant is still a mystery to most. Through my work as an intuitive and psychic medium, I’ve received information about how astrology can be used to support people in adapting to the major shift in consciousness on the Earth that has affected all its inhabitants, whether animal, vegetable or mineral marked by the end of the calendar a few years ago. It was the beginning of a long process we’re now in, not the ending of something and not simply new-age hype. In the years leading up to it, we were challenged to live with a lot more information coming at us than ever before. To handle it and the changes taking place now, we need to let go of old energies, attitudes, and behaviors we’re carrying and learn to live in the present moment. The invitation is to process and release so that we can live with all of our chakras as tools, and not as distractions clogged up with biographical sludge we don’t know what to do with. I’ve written this report to support you in seeing what you might not see about this process, what you might need to do, and to support you in getting started. The report addresses the wounding associated with the Pluto, Chiron, Lilith and Lucifer archetypes. It explains how to shift your consciousness about what each means, allowing yourself to learn to let go of the emotional debris you might be carrying from the past. We’re carrying such debris from earlier in our lives but also from past lives, and each of us needs to learn to process and release it. The report consists of an introduction and essay on the end of the Mayan Calendar, an essay on each of the four archetypes and a section on your house and sign placement for each of the four placements in your birth chart (Pluto in your house & your sign, Chiron in your house & your sign, etc.). Each house and sign section ends with a set of questions for self-reflection to help you see how the archetype applies to your life, aiming to open doors into how you experience and can improve your understanding of each. The questions are a sort of homeplay tailored to each placement to shine some light into some corners of your psyche that aren’t often seen. The exchange rate is $25. The report is about 13,000 words/23-24 pages in length and e-mailed as a PDF. E-mail your birth data to me and I will have the report to you within a week. Absolutely AMAZING report, Tom! I had to repeatedly laugh at how uncanny it was. Spot ON. Something to read often and work with over time, that’s for sure. Thanks so much! Devoured it with great interest. Beautifully written – really gets to the nuts and bolts of things and speaks to the issues that keep dogging me. The questions are great, a wonderful way to really nail the defenses. So lots to work with. Many thanks. Thank you for your commitment to heal the planet with these great insights and teachings. 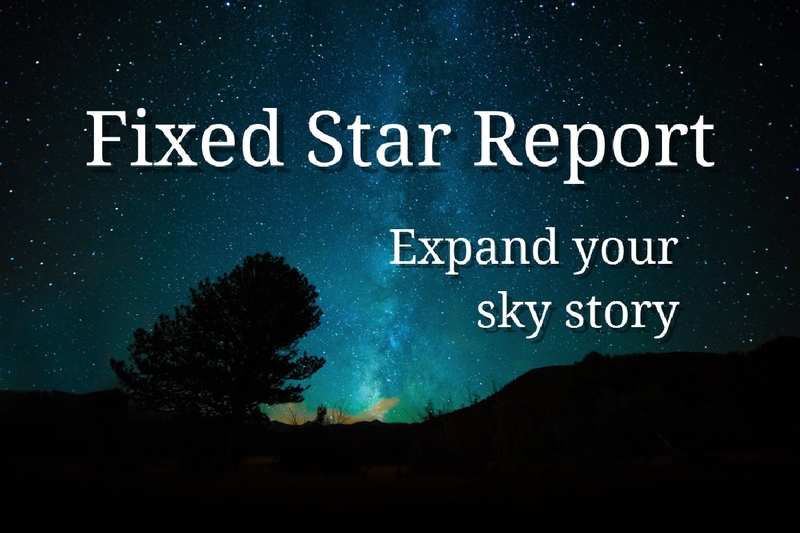 Expand your understanding of astrology into new dimensions with a fixed star report. This insightful natal report explains the meaning of the positions of the fixed stars (Regulus, Canis Major, Spica, Aquila, etc.) at the time of your birth. It serves as a great introduction to visual astrology. The fixed star report was written by Bernadette Brady. Brady is co-principal of Astro Logos, one of Australia’s largest astrological schools dedicated to the education and qualification of practicing astrologers and a Faculty Member of the Astrological Guild of Educators, International. The report was generated by Starlight, available from Zyntara Publications Ltd.
From the author Bernadette Brady: “On the day you were born, you not only gained the magic of your horoscope, you also gained the myths and meanings of a sky full of stars. Not all the stars, just those that formed links to your natal planets via what is called parans. By considering the star parans in your life you will be encountering a whole new (though very old) layer of myth and meaning to your chart. Welcome to your Stars. A note from Tom Jacobs: It’s normal in writings on the fixed stars to find hard-edged, stern interpretations that can seem negative and fatalistic. I’m offering this report not to encourage that, but to provide you key words and phrases for the energies of the fixed stars to stir your own thinking and research. As I’ve always said with fixed star teachings, do not give into any dark interpretations you read, as there is no such thing as destiny beyond that we will encounter certain themes and will need to learn to respond to them in healthy ways. An example report for Joan of Arc is here. Investment: $25 via PayPal here. To use another form of payment, contact me at (213) 925-6019 (do not leave credit card details on voicemail–I’ll call you back). After ordering, email me with your full birth data. Your report will be delivered as a PDF via email within a few days. Note: There are 2 shopping carts; one for digital downloads, and another for other purchases.